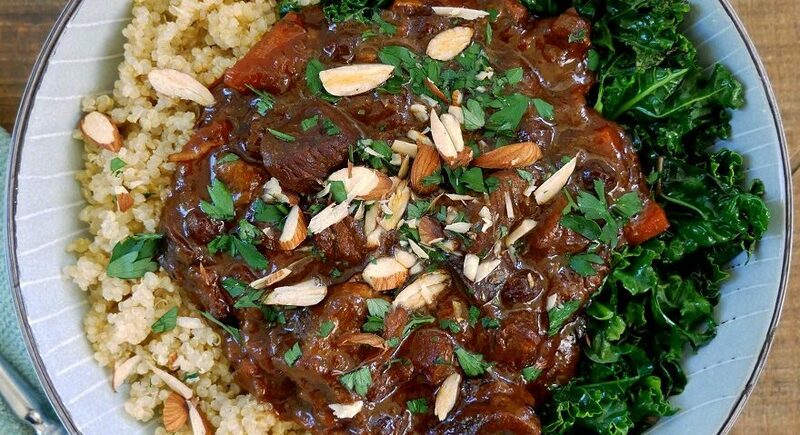 served with quinoa and sauteed silverbeet and kale, this dish elevated with the North African spice mix is a great way to enjoy the cooler evenings! Heat the coconut oil in a large frying pan on medium-high heat. Add the onion and saute for approximately 2 minutes. Add the lamb, carrots, lemon and garlic and stir the onion through starting to brown the lamb slightly. About 1-2 minutes. Add the Ras El Hanout and stir through until the spice aromas are released. Remove from the heat. Place the lamb mixture into your slow cooker. Add the remaining ingredients (except for almonds, parsley and arrowroot). Stir through gently until combined. Set the slow cooker to HIGH for 4 hours or LOW for 8 hours. If you are ready to serve and wish to have a thicker consistency, combine 1 tbsp arrowroot with equal water until dissolved. Add to the lamb and gently stir through. Allow to heat and thicken for about 10 minutes. Once ready, serve with sauteed silverbeet and kale and quinoa. Top with chopped almonds and parsley.